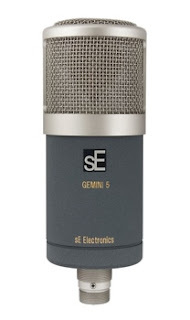 This is a wonderful high end condenser microphone. Has a large diaphragm capsule that gives it warmth and clarity. It is a tube mic with a single tube inside. For a different sound you can swap out the tube for an FET circuit because of its unique PSU housing. It also comes with its own shock mount which is always a good thing. It retails for around $1200 dollars. For more info visit SE Electronis here.